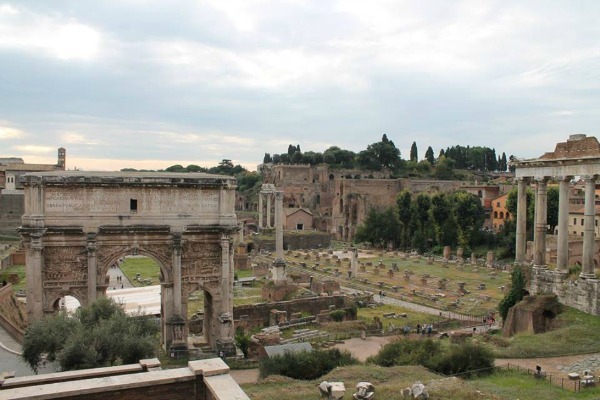 Today I’m back to share the next leg of our Italian adventure – Rome! 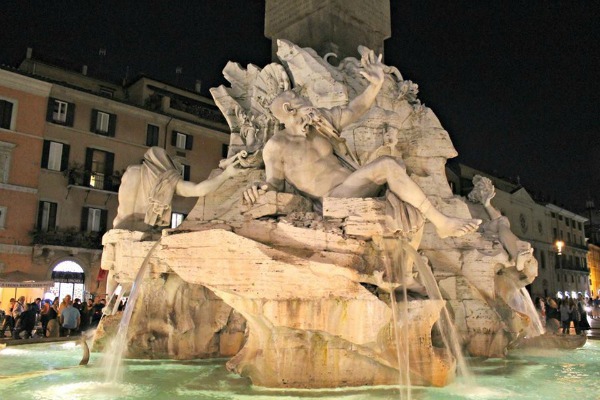 I was so excited for our stay in Rome and the Eternal City did not disappoint. I have so many wonderful memories and pictures to share that I’m going to split this recap into two parts, plus a separate Vatican City recap. OK, let’s jump into our first two days in Rome! We arrived in Rome in the late afternoon and after dropping off our luggage, our guide took us for an optional tour around part of the city. We took the Metro to the Spagna stop to see the Spanish Steps. 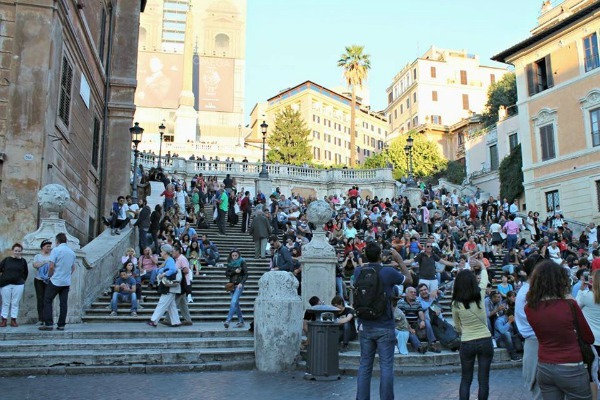 If you’ve seen the movie Roman Holiday, you might be familiar with the Steps. Unfortunately, the church at the top of the steps was under renovation and the fountain at the bottom was empty, so it was pretty underwhelming. 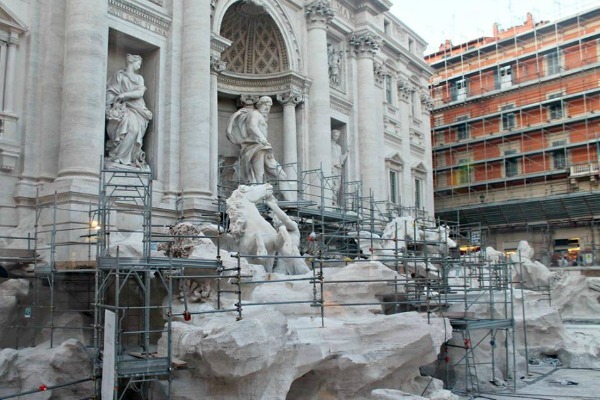 From there we walked to the Trevi Fountain, which was closed for restoration. 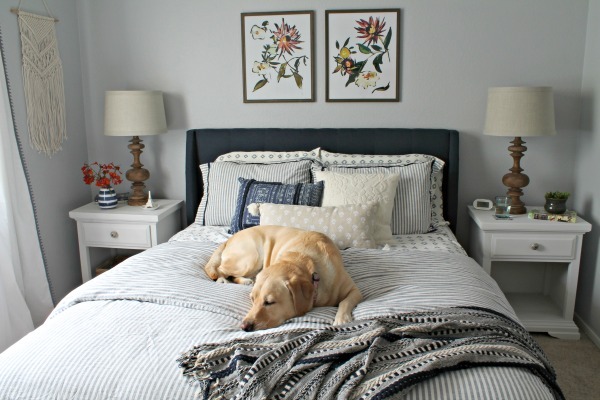 We knew that ahead of time, but were still pretty bummed. I can only imagine how beautiful it is when the water is running. They had a small water basin set up so people could still throw their coins into the fountain. Don’t forget, it’s right hand over the left shoulder! 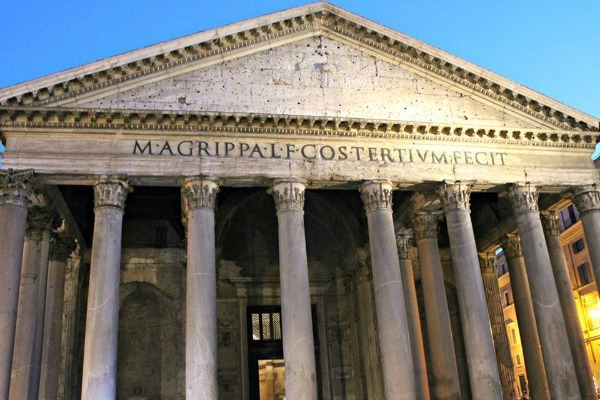 Our next stop was the Pantheon, which is the most preserved building of ancient Rome. 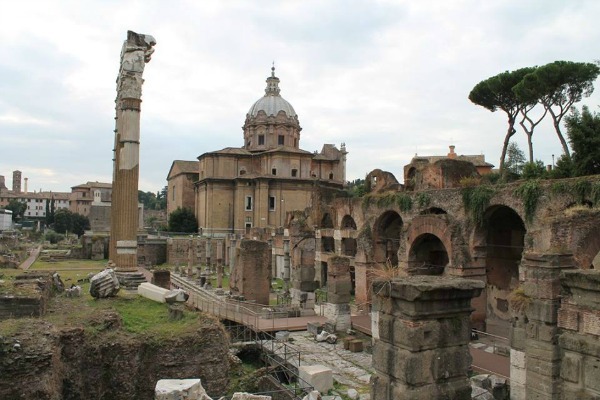 It was constructed as a pagan temple in A.D. 125, but was given to Pope Boniface the IV to use as a church in A.D. 608. That’s the main reason it’s still so intact. 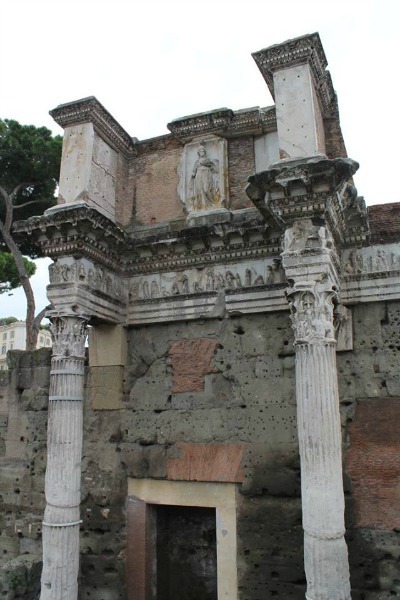 Our guides told us that when Christianity began to gain considerable political power in Rome (late 4th century/early 5th) they started destroying pagan temples, sites, statues, and art. It’s such a shame to think about how much history was destroyed during that time period. 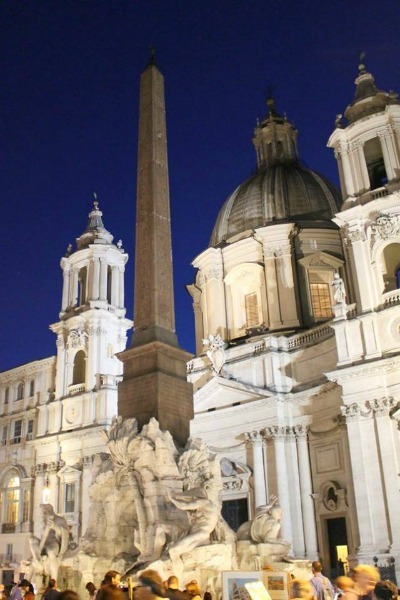 We ended our night with dinner at a cafe near Piazza Navona…and gelato afterwards of course! The following day we went on a walking tour of Rome. 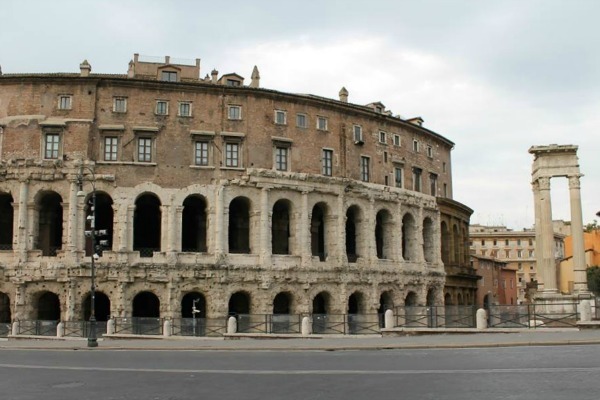 We started at the Marcello Theatre, which resembles the Colosseum, but was actually built 80+ years prior. From there we walked up the street to Capitoline Hill, one of the Seven Hills of Rome. 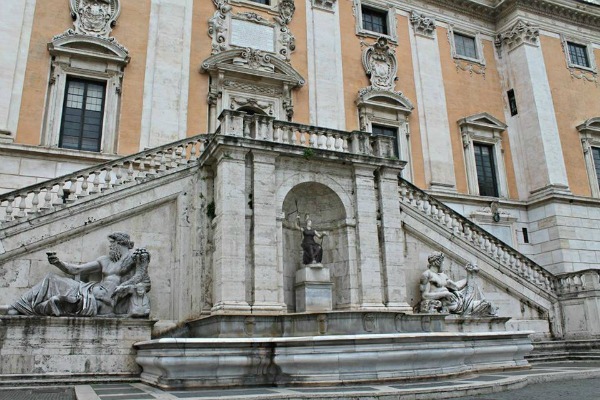 Up the Cordonata stairs is Piazza del Campidoglio, designed by Michelangelo. The building straight ahead is the Palazzo Senatorio, the city hall of Rome. 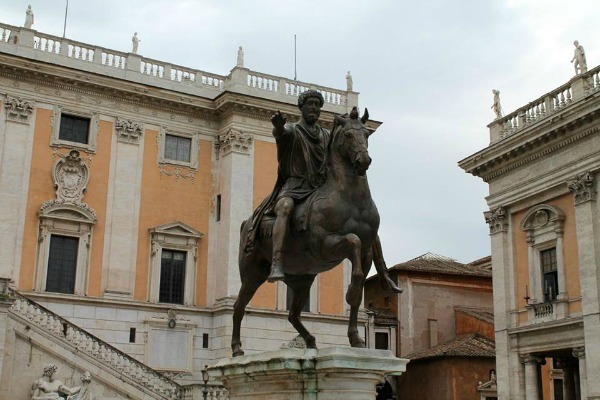 The statue in the middle is Emperor Marcus Aurelius, but was at one point believed to be Emperor Constantine, the first Christian emperor. Our guide said that’s probably the only reason it wasn’t melted down and reused for coins or for another statue. 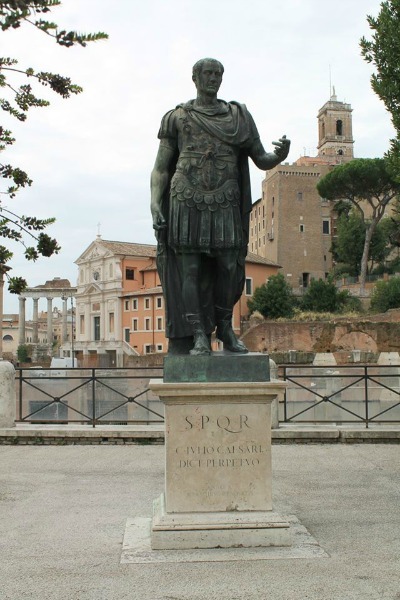 One article that I read said it’s the only fully surviving bronze statue of a pre-Christian Roman emperor. Of course this is just a replica. The original statue is in a nearby museum. 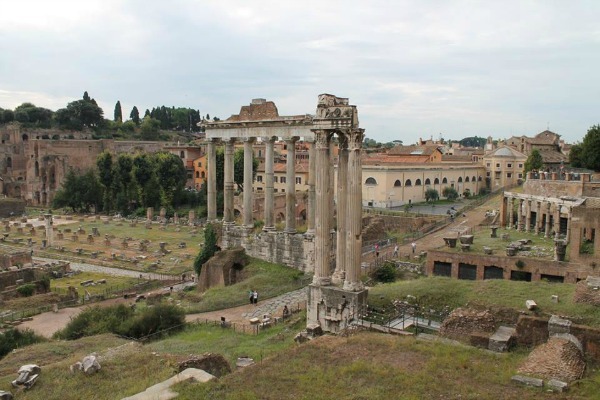 Once you pass the buildings, you can start to see the Roman Forum. As you continue down the hill, the view just get better and better. Once we were back down the hill, we headed towards the Colosseum. 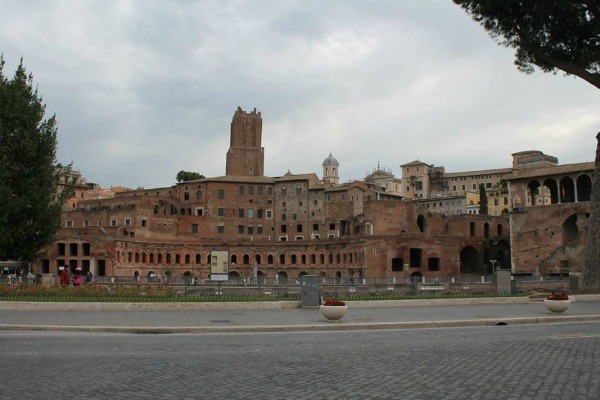 On the way we passed a statue of Julius Caesar on the right and Trajan’s Market and the Forum of Augustus on the left. 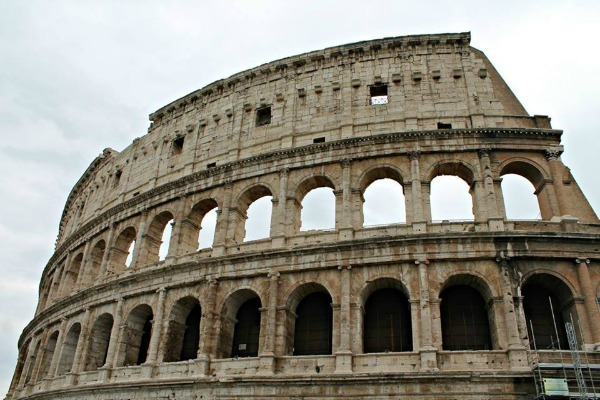 The Colosseum was one of the places that I was most excited to visit while in Italy…and it didn’t disappoint. 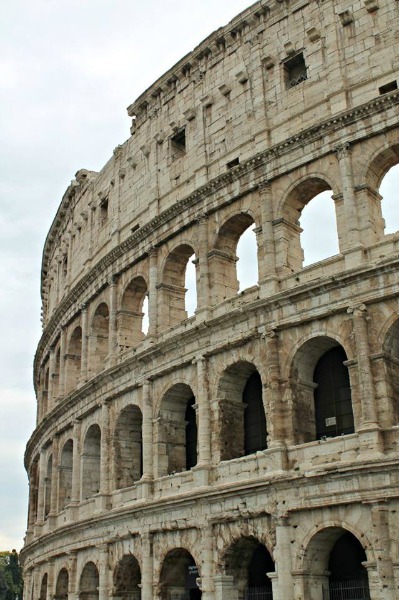 Built in A.D. 80, the Colosseum has survived almost 2000 years of weather, earthquakes, neglect, vandalism, and was even used for building materials in the 18th century (only about a third of the original structure remains). 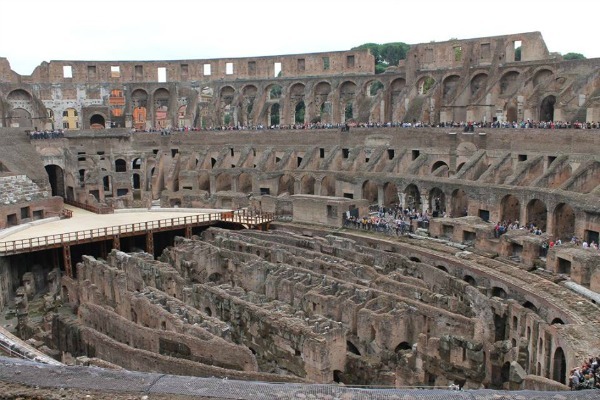 Fortunately, in the 18th century various popes sought to conserve the Colosseum as a sacred Christian site and now years of restoration will hopefully prevent any further damage to the arena. Did you know that the arena could be flooded and filled with water for staged naval battles? 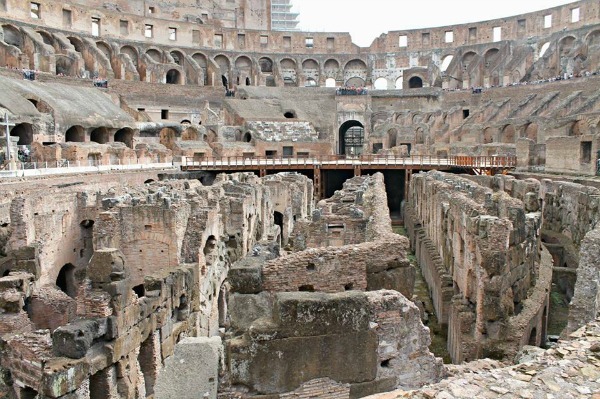 Of course the main entertainment in the arena was gladiatorial combat and wild animal fights. Did you also know that the Colosseum originally had awnings that could be rolled out from the top story to protect spectators from the heat? The Colosseum was our last official stop of the day so we were free to explore on our own the rest of the afternoon. 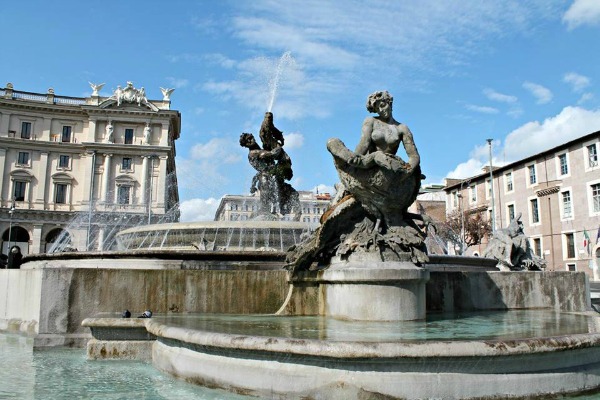 We decided to explore the city around our hotel, which was near the Piazza della Repubblica. Of course we had to check out the beautiful Fountain of the Naiads. 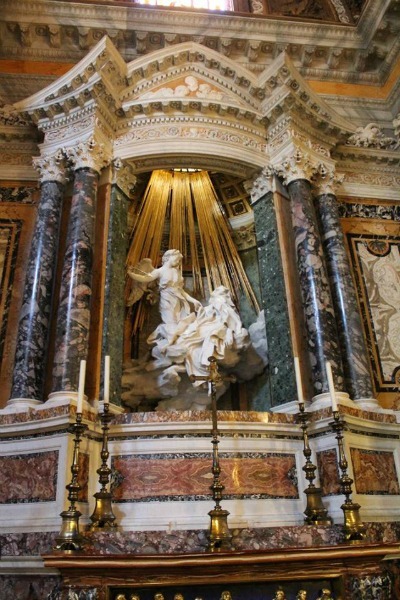 We also walked to the Chiesa di Santa Maria della Vittoria, home to Bernini’s marble statue The Ecstasy of Saint Teresa. Actually we walked over there twice because we didn’t realize it’s closed from noon to 3:30 p.m. daily, so learn from our mistake if you ever go there. You might also recognize the church as the “fire” location from the book/movie Angels & Demons by Dan Brown. From there we just explored a bit more of the area, ate gelato, went for drinks on the hotel rooftop, and then had dinner. Part 2 of the recap coming soon! 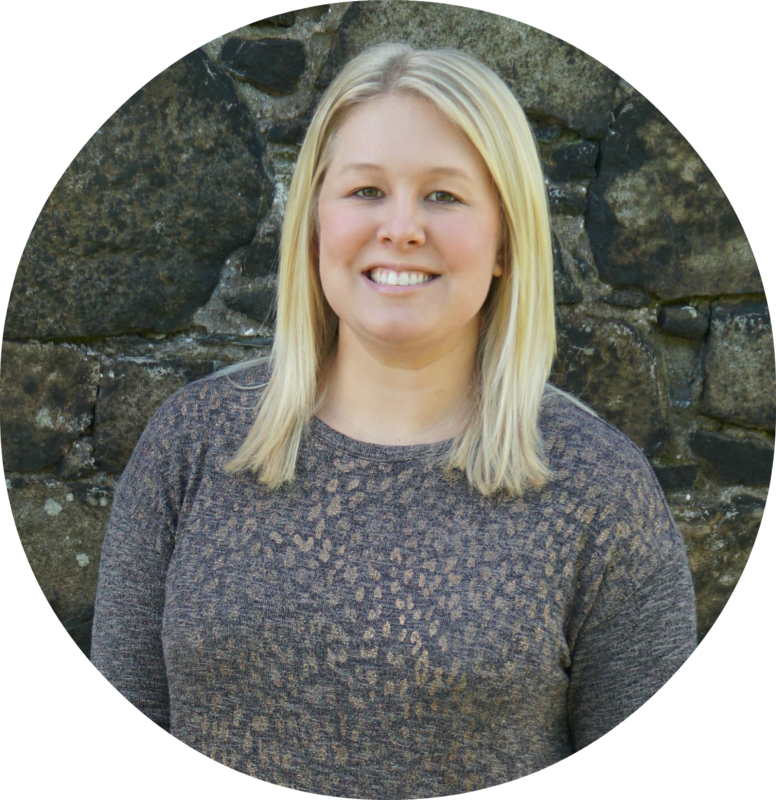 I've been getting #wanderlust lately, it's awesome to go look at your blog and live vicariously! It's amazing! !